The avian ureter can be divided into a pars renalis and a pars pelvica. The pars renalis or intra-renal part of the ureter runs at the cranial part of the kidney, embedded into kidney tissue. The pars pelvica or extra-renal part comes to the surface and runs ventrally of the caudal part of the kidney to finally pass the cloacal wall and enter the urodeum. 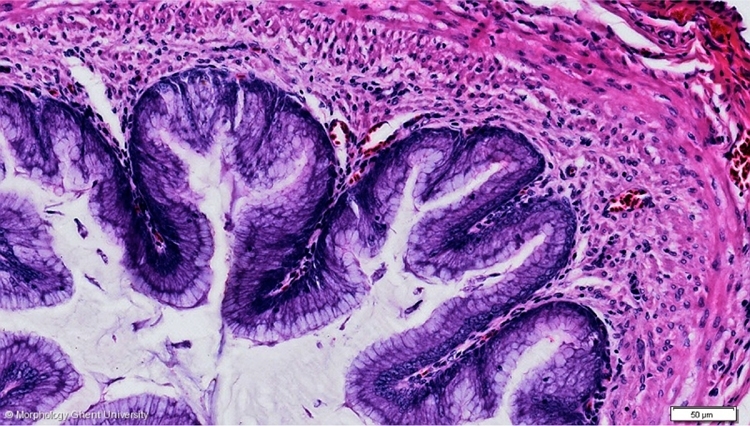 The wall of the ureter exists of three layers: T. mucosa, T. muscularis and T. adventitia. The muscular layer is very thick and consists of an inner longitudinal and an outer circular layer of smooth muscle tissue.